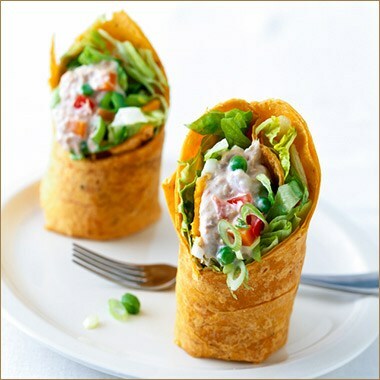 Bursting with flavor, these delicious wraps combine the creamy goodness of almond butter with cilantro, red onion and ginger to create an elegant and tasty lunch alternative that’s quick and easy to prepare. Place all ingredients in a medium size bowl. Whisk until smooth. Place large tortilla on flat surface and cover with green leaf lettuce. Spread 2 – 3 tablespoons sauce over lettuce. Place grilled chicken breast, shredded carrots, red onion slices (to taste), and 8 to 10 cilantro leaves. Fold in sides of tortilla and roll.